← How fast is JAGS? 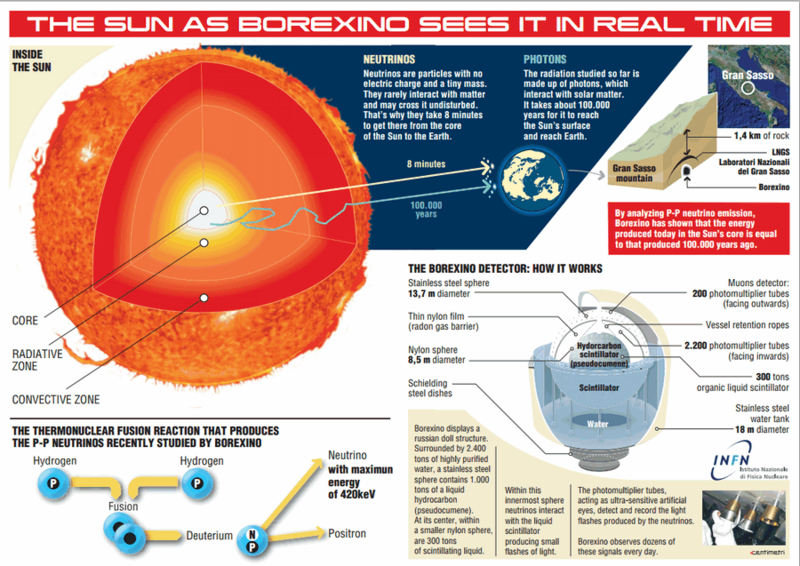 Borexino has managed to measure the Sun’s energy in real-time, detecting the neutrinos produced by nuclear reactions inside the solar mass: these particles, in fact, take only a few seconds to escape from it and eight minutes to reach us. Previous measurements of solar energy, on the other hand, have always taken place on radiation (photons) which currently illuminate and heat the Earth and which refer to the same nuclear reactions, but which took place over a hundred thousand years ago: this, in fact, is the time it takes, on average, for the energy to travel through the dense solar matter and reach its surface. The comparison between the neutrino measurement now published by Borexino and the previous measurements concerning the emission of radiant energy from the Sun shows that solar activity has not changed in the last one hundred thousand years. “Thanks to the results of this new Borexino research we have seen, via the neutrinos produced in the proton-proton (pp) reaction, that it is the chain of pp nuclear fusions which makes the Sun work, providing precisely the energy that we measure with photons: in short, this proves that the Sun is an enormous nuclear fusion plant,” says Gianpaolo Bellini, one of the fathers of the Borexino experiment. The Borexino detector, installed in the INFN underground Laboratories of Gran Sasso, has managed to measure the flux of neutrinos produced inside the Sun in the fusion reaction of two hydrogen nuclei to form a deuterium nucleus: this is the seed reaction of the nuclear fusion cycle which produces about 99% of the solar energy. Up until now, Borexino had managed to measure the neutrinos from nuclear reactions that were part of the chain originated by this reaction or belonging to secondary chains, which contribute significantly less to the generation of solar energy, but which were key to the discovery of certain crucial physical properties of this “ephemeral” elementary particle, the neutrino. remain so for a number of years, thanks to state-of-the-art technologies used in its construction, which have allowed not only the neutrinos emitted from the Sun but also those produced by our Earth to be studied. For more, see the Borexino Collaboration at Laboratori Nazionali del Gran Sasso. This entry was posted in astronomy, astrophysics, Carl Sagan, climate, energy, geophysics, physics, science, solar power. Bookmark the permalink.